This article is about the siege tactic. For the sport utility vehicle, see Cadillac Escalade. For the attack of Geneva in 1602 and Swiss celebration, see L'Escalade. For proposed entertainment complex, see Grand Canyon Escalade. Escalade is the act of scaling defensive walls or ramparts with the aid of ladders, and was a prominent feature of siege warfare in medieval times. It was one of the most direct options available for attacking a fortification, but was also one of the most dangerous. Escalade consisted simply of soldiers advancing to the base of a wall, setting ladders, and climbing to engage the defending forces. This would generally be conducted in the face of arrow fire from the battlements, and the defenders would naturally attempt to push ladders away from the wall. Heated or incendiary substances such as boiling water, heated sand, and pitch-coated missiles were sometimes poured on attacking soldiers. As the result of all this, it was often difficult for attackers to reach the top of the wall. Even when they did so, however, they would be heavily outnumbered by the defenders. Often, the objective of escalade was not to take the fortification itself, as it was thought impossible to get sufficient numbers of troops up the ladders. Rather, infiltration in this manner had the intention of opening the fortification's gates, to allow a more direct attack. Fortifications were often constructed in such a way as to impede escalade, or at least to make it a less attractive option. Some of the measures taken to counter escalade included the digging of moats (which prevented ladder-bearing soldiers from reaching the base of a wall), the construction of machicolations (which facilitated attacks on enemy soldiers while they climbed), and walls incorporating a talus feature. Because of the difficulties involved, escalade was usually very costly for the attackers. 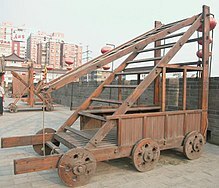 Two critical factors in determining the success or failure of escalade were the number of ladders and the speed with which they could be arranged. A slow attack gave the defenders too much time to pick off the attackers with arrows, while having too few ladders meant that the number of troops would be insufficient to capture the battlements. A third important factor was the estimation of the height of the wall. If the ladders were made too long they could be easily pushed to one side and if too short the attackers could not pull themselves up onto the top of the wall. Tactics employed included getting as many men on the ladder at the same time (the more men that were on the ladder at the same time, the more its weight and the more the difficulty of dislodging it), attacking by night or at a remote part of the wall. Escalade was, in essence, an attempt to overwhelm defenders in a direct assault rather than sit through a protracted siege. Attackers would generally attempt escalade if they had reason for wanting a swift conclusion, or if they had an overwhelming superiority in numbers. Otherwise, less costly siege tactics were often preferred. Modern assaulters sometimes use off-the-shelf ladders or firefighting ladder trucks to attack a building through upper windows and balconies. Purpose-modified vans and trucks with a variety of ramps, ladders, and stairs on the roof are also available. SWAT teams and other special forces units often put these to use to raid a house through an upper window and the front door simultaneously. L'Escalade, the celebration of the surprise attack by Duke Charles Emmanuel of Savoy's troop on the city of Geneva in 1602. The attack was conducted by escalade, which gave its name (in French) to the yearly event. Escalade was also an important feature of the capture of the fortified town of Badajoz by Wellington's troops in 1812 during the Peninsular War. This page is based on the Wikipedia article Escalade; it is used under the Creative Commons Attribution-ShareAlike 3.0 Unported License (CC-BY-SA). You may redistribute it, verbatim or modified, providing that you comply with the terms of the CC-BY-SA.